Hello. Lordy. Where did the month go? I just cannot seem to get a good blogging schedule going! I don't know about y'all about but last week just about killed me! Red Ribbon Week and Halloween...WHEW! That makes for 1 LONG week! We survived and had a blast. I'm ready for a more calming (and shorter) week! I'm linking up with Farley today. Loving - The time change. I know I'm weird but I LOVE when we fall back. I love that we gain another hour in the day and I am so excited that it won't be pitch black when we leave for school now. I know it gets dark earlier (but I secretly enjoy that). I won't feel as bad in my pj's at 5:30! 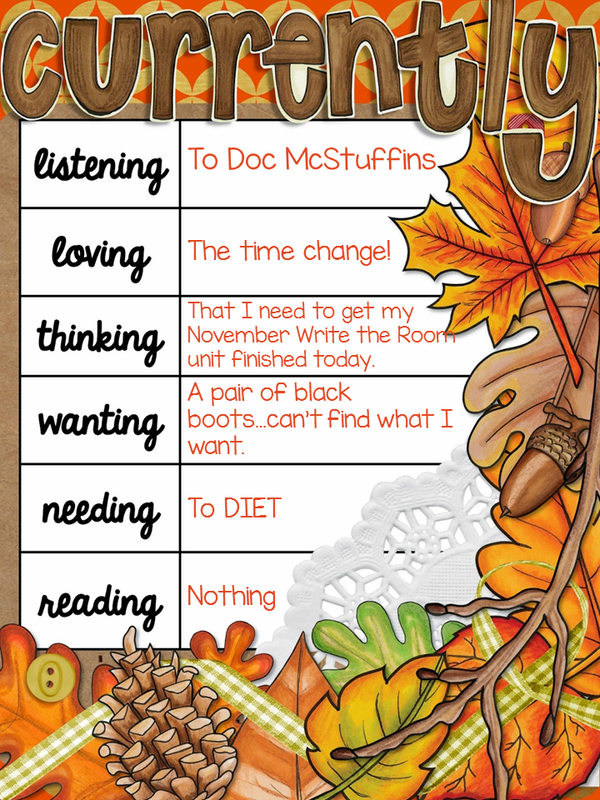 Thinking - I have GOT to finish my November Write the Room today. #1 because we need it in class and #2 I may or may not have not finished my October unit until October 26. Gotta get ahead. Wanting - I've been on the look for a good pair of black boots that I really like...within my budget. I've not found them but I'm going on a shopping trip next weekend for my birthday! Needing - To Diet and get serious! Y'all...it's bad. Reading - Nothing. I LOVE to read but I really don't read a book unless I am on vacation or it is the summer. If I get into a good book I cannot put it down. That means I am up reading a book at 1am on a school night when I am normally in bed by 9:30. I hope you will link up with Farley too! Hi! I am with you on the Fall Back thing! I immediately get in my pajamas or yoga pants when I get home so I don't mind it getting darker earlier either :) Have a great day! Happy early birthday! Ooo...I have recently been looking for a pair of boots too. I'm pretty picky, though, and tend to shop with a budget in mind. Good luck to you in your search! I totally agree I need to get on the "diet" wagon too. You know it is bad when the only things that still fit are the maxi skirts you own...true. I also love falling back. I always change the minute I walk in the door, and now that it is getting cooler those flannel pj bottoms are so comfy, and if it is already dark then I don't feel so bad. Have a great week! I totally get the diet part...my husband and I were going strong with a clean eating plan before my daughter wound up in the hospital for a week. Then it all went down hill...and not a good time of the year to try and get back to it! Asking for a treadmill for Christmas!